Helping our community resolve disputes peacefully through conflict management services and training. We are a provider of conflict management services and training. Norval (John) Settle, J.D., MPA has been named “2018 Mediator of the Year at the 2018 VMN annual Fall Training Conference. This honor is in recognition to his significant contributions over the years to the field of mediation. John is a mediator, trainer, and board member at CMG Foundation. CMG Foundation is a proud member of Resolution Virginia, formerly VACCR (Virginia Association of Community Conflict Resolution.) 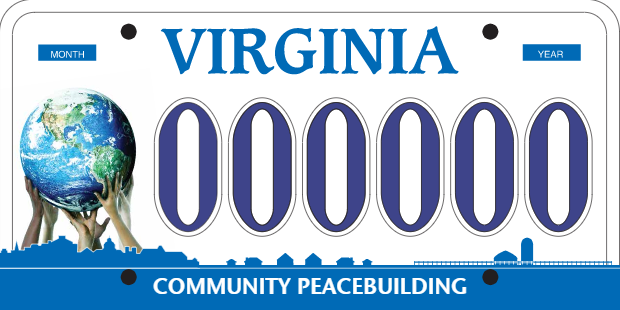 One year after the tragic events in Charlottesville, a new Virginia license plate supporting community peacebuilding is available for purchase. $15 of each $25 purchase will go towards the community peacebuilding work of Virginia’s not-for-profit community dispute resolution centers that are members of Resolution Virginia. Click here for information about obtaining the plate from the DMV.